Air Rifles 1 & 2: Beginners, under 15, start in Air Rifles-1 and progress to Air Rifles-2. When ready, an athlete advances to a .22 caliber rifle. Note that there are only upper age limits in these younger categories. International Biathlon Union (IBU): Athletes 17 years or older progress on the basis of the IBU categories- Youth Men/Women, Jr Men/Women and Sr. Men /Women. This progressive approach to mastering the sport is in line with the Biathlon Canada model for Long Term Athlete Development (M-LTAD). Please note: At their discretion, coaches may move any athlete to a training group they deem appropriate. Adult Recreational: The Sport Men/Women category is intended for athletes over 18 years old, that do not wish to participate in a competitive class (IBU). Master Men/Women is for athletes over the age of 35. PAL: A PAL (Possession and Acquisition License) is required for each rifle athlete and parents. Athletes over 12 years of age must obtain their own Minor’s PAL. Please ensure a minimum of one adult family member has a PAL by the time programs begin. For information on obtaining a PAL contact aheia.com or a gun range. ENSC Membership: ENSC Biathlon Program participants must have an ENSC membership. 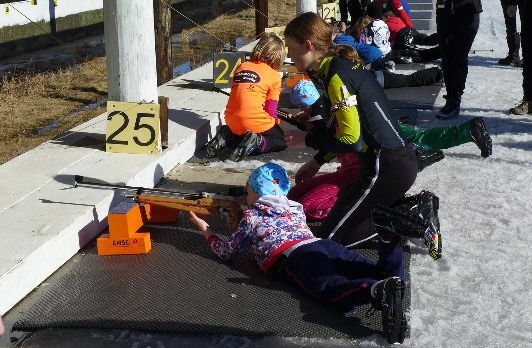 The ENSC Biathlon Bears program is for beginners, teaching the basic skills of air rifle safety and marksmanship, as well as skate skiing, in a safe and motivating environment. The Bears program aims to develop the enjoyment of Biathlon, focusing on team building and having fun, for both first time skiers, as well as challenging returning Bears. No previous skiing or shooting experience is necessary. Athletes are encouraged to compete in the Air Rifles divisions at local and provincial events. Air Rifle 1: Bears AR1 will shoot with a rest on big targets (35mm). Through the Biathlon Bears programs, a combination of skiing and shooting instruction is given, with the emphasis on enjoyment and fundamental skill development. Air Rifle 2: This program is designed for returning Bears, looking to improve their fitness and skills previously experienced in AR 1. AR2s will still shoot with a rest, but on smaller targets(15mm). This group will focus on appropriate ski and shooting techniques, to prepare the participants for advancing to the .22 caliber rifle program. Schedule: Wednesdays 6:30-8:00PM and/or Saturdays 10:00AM-11:30PM. Equipment: Air rifle and ammunition provided. Skate skis, boots & poles provided by the athlete. Ski rentals are available through ENSC. Location: Biathlon practices are held at the Edmonton Nordic Biathlon Centre @ Strathcona Science Park. Additional Ski Lessons: see ENSC Cross Country programs for biathlete options.